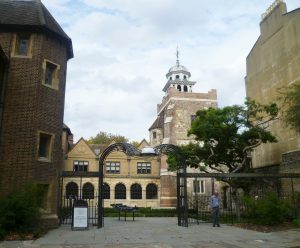 The Charterhouse has to be one of the most interesting buildings in London. Its story begins with the arrival of the Black Death in 1348, continues through the upheavals of the Reformation, the ups and down of educating schoolboys for nearly two and a half centuries, not to mention a direct hit from an incendiary bomb in May 1941. It’s a wonder there’s anything left of it at all. What remains today is an eclectic mix of medieval, Tudor, and later 17th century buildings which have been adapted over the centuries to serve the different needs of a Carthusian monastery, a boys’ school, alms houses for the Brothers, and, nowadays, rooms which can host concerts, lectures and events. 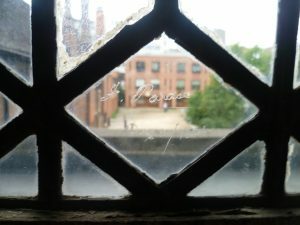 It’s a sort of palimpsest with traces of its history in the very brickwork, carved into the wood and even engraved as 19th century graffiti in Tudor window panes. 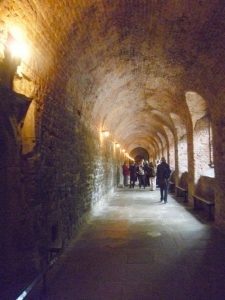 The history of Charterhouse begins in 1348, when two burial grounds, funded by Sir Walter Manny and the Bishop of London, were opened as an act of piety at Smithfield, just outside the city walls, to cope with the rising numbers of victims of the Black Death. Recent archaeological excavations by Crossrail have revealed twenty-five plague skeletons, each buried in a shroud, and placed carefully with their heads facing east, towards Jerusalem. One couple was holding hands; another female skeleton had her baby on her breast. This was no plague pit with bodies just thrown in; all was carefully and reverently done. Sir Walter Manny (1310-1372) was the Charterhouse’s first benefactor. Born in Hainault he came to London in the train of Philippa of Hainault, queen of Edward III, and rose to become one of King Edward’s most trusted military and diplomatic advisors. In his will, Manny left money for the founding of a Carthusian monastery to pray for the souls of the dead – and his own. Recently, Sir Walter’s own tomb was identified. 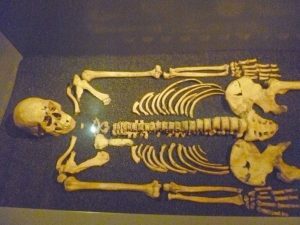 We know it is his skeleton because his right hand clutched the lead bulla sent to him by Pope Clement VI, granting him permission to choose his own confessor – a sure path to salvation. 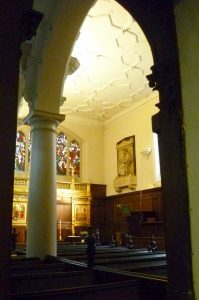 The Chapel is much altered but stands on its original site. The Carthusian order is an enclosed one with the monks remaining in their cells, praying and reading, and coming out solely to attend services. They were looked after by lay brothers. However, the monastery lasted only about 170 years until the Protestant Reformation when Henry VIII broke from Rome and declared himself head of the Church of England. He demanded that the Charterhouse’s prior, John Houghton, signed his acceptance of this decree. 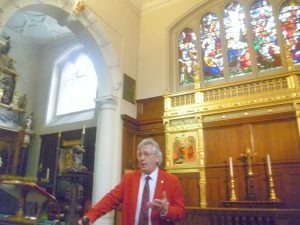 Out knowledgeable and genial guide, Brother Mansel, in the chapel. Behind him is a Victorian stained-glass window with a modern icon underneath. To the left is Sir Thomas Sutton’s tomb. The monks convened in the chapel to discuss their grave situation. They were in no doubt about the grim fate which awaited them as traitors – hanging, drawing and quartering – if they refused to sign. The younger brothers were sent to the continent for safety and, in 1535, Prior John Houghton and several others were executed for treason, and more brothers died of starvation in prison. The monastery was seized for the crown and anything which smacked of papacy was destroyed. Sir Edward North (1496-1564), treasurer of the Court of Augmentations (augmenting the King’s treasury by the lucrative sale of former monasteries) oversaw the Charterhouse’s dissolution and was duly knighted for his services. He managed to survive the reigns of the next three monarchs – his financial ability was obviously highly valued – and he became extremely rich. He acquired what remained of the ruined monastery and built himself a courtyard house, re-using much of the stone work. The Great Hall, built 1540s, embellished 1571. 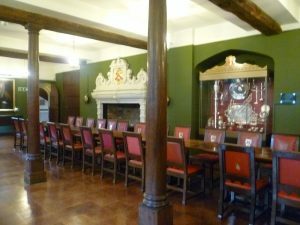 It is now the Brothers’ dining-room. Queen Elizabeth I stayed here for four days before her formal entry into the City of London as queen. During her half-sister Queen Mary I’s reign, she had been imprisoned in the Tower of London, and she was taking no chances. She needed to be sure of her welcome. She became the Charterhouse’s first royal patron. The Charterhouse was then sold to Thomas Howard, 4th duke of Norfolk (1536-72) who was Queen Elizabeth’s cousin and an ambitious man.. He did what new owners are apt to do; he embarked on a rebuilding programme and renamed Charterhouse, Howard House. Unfortunately, he misguidedly supported the 1571 Ridolfi plot, which planned to assassinate Queen Elizabeth and put the Catholic Mary, Queen of Scots on the English throne – with Howard as her husband. He was tried and executed. The house passed to the first earl of Suffolk, Howard’s second son (1561-1626). 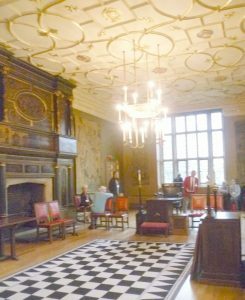 He managed to find favour with the next monarch, James I, who was invited to hold his first court at Howard House before entering the City of London – another cautious monarch needed to be sure of his welcome. Suffolk was Lord High Treasurer from 1614-18 but fell from grace in 1619 when he was fined and imprisoned for embezzlement. Enter Thomas Sutton (1532-1611), the philanthropist who, in 1611, turned the Charterhouse into the largest charitable foundation in Europe, taking care to arrange for 16 governors to run his Foundation, including the monarch (James I), the Archbishop of Canterbury and the Lord Chief Justice. 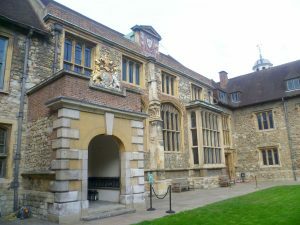 All subsequent monarchs, including Queen Elizabeth II, have been governors of the Charterhouse. He set up a hospital for 80 elderly inmates of good character but in financial need – and Protestant, naturally. Each Brother, as they were (and are) called, has his own small flat and a garden. They ate communally and were expected to attend the chapel services. Early Brothers included musicians, book collectors, poets, scientists (in the field of electricity – very advanced in the 1730s), and artists. Sutton also set up a school for 40 Foundation Scholars. Over the next few centuries, the numbers rose and began to include fee-paying schoolboys, and Charterhouse boys gradually came to occupy most of the site: they played football in the old cloisters and the problems of playing in a long narrow space led to the introduction of football’s off side rule in order to make things fairer. Norfolk Cloisters; the schoolboys played football here. 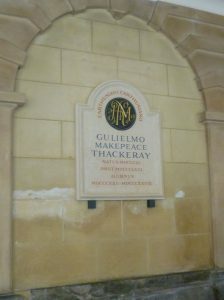 Old boys include the novelist William Makepeace Thackeray – who loathed his time there; John Wesley, the founder of Methodism; the Victorian soldier hero, Sir Henry Havelock – whose statue now stands in Trafalgar Square; and Robert Baden Powell, who founded the Boy Scout Movement. 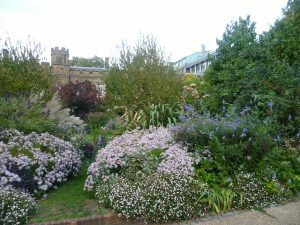 In 1872, the school moved to Godalming, where it still flourishes. Today, the Charterhouse remains a charitable foundation and supports more than 40 Brothers in financial and social need and helps them to lead independent and purposeful lives. They no longer need to be Protestant, or to attend services in the chapel, or even to be male. It’s a fascinating place and I thoroughly recommend a visit. My grateful thanks go to Brother Mansel who showed us round in such an enjoyable and knowledgeable way; and to the volunteer Guy who was unobtrusively helpful in seeing that I got the photos I needed. Your posts are always so interesting and filled with historical detail. This is no exception. I am fascinated by the changes wrought upon buildings by successive inhabitants, not to mention their personal histories. This now reminds me of our Sackville College, an almshouse which is still going. In fact I applied to live there, but found I couldn’t because the rules state you can’t earn anything at all! Your pension income is fine. Everyone has a small flat and they have carved out bathrooms and kitchens within them. It’s over 400 years old and is, I believe, one of the few almshouses still retaining their original purpose. What a shame! The Charterhouse Brothers facilities include an infirmary, an art studio, a library and a common room and several Brothers (of both sexes) do voluntary work both inside the Charterhouse and outside. Our excellent guide was one of them. Thanks for this interesting post, Elizabeth. I enjoy hearing about the changes made to old buildings and this one certainly has had a colourful history! Thank you for your comment, Gail. 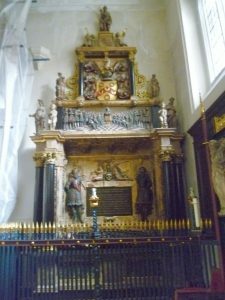 It’s one of those ‘If Stones Could Speak’ places: Prior John Houghton’s awful meeting in the chapel when the brothers realized the full implications of saying ‘No’ to the king; and the Duke of Norfolk agonizing in the Great Chamber over his dream of marrying Mary Queen of Scots – and his betrayal of his cousin Elizabeth I. One of the stories I like most is the quick-thinking of Dr Harris of St Bartholomew’s Medical College, who was on fire-watching duty on the night of May 10-11, 1941, when the incendiary bomb fell. 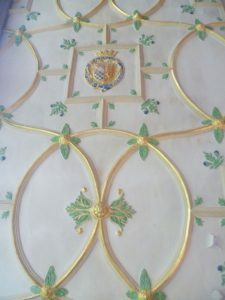 He had the presence of mind to close the heavy medieval oak door to the chapel – thus buying time for the fire-fighters to save the chapel from destruction. The remains of the door, blackened and half-destroyed, is still there as a reminder. That was clever of him! I live in a house that was built around 1680 and the door to our kitchen was the original outside door. It’s really solid and it’s oak banded with iron so I can imagine how it would take a door like that quite a long time to burn through. How wonderful to live in a 17th century house! Your kitchen door sounds very similar to the Charterhouse oak door which seems to have lots of iron studs in it – at least that’s what its photo looks like. Thank you for your comment, Anne. 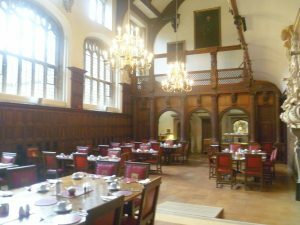 Interestingly, the Merchant Taylors’ School moved into the Charterhouse when the Charterhouse boys’ school moved out in 1871. Later, the Merchant Taylors’ School also moved to the country. 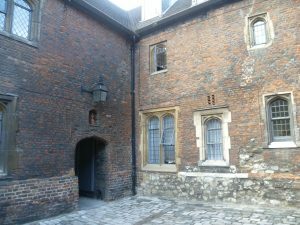 My post was greatly helped by the excellent Charterhouse Guidebook – and a most helpful site map, without which I’d have had real difficulty in working out which photo of an ancient arch leading down a dark corridor went into which medieval square!